Golden Goal are the prime most company when it comes to providing association football (soccer) equipment. 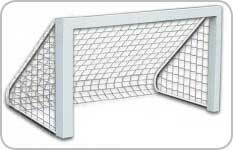 The company specializes in goal-posts and provide the best ones in the market for commercial uses. Constructed using aluminium, these goal posts are not only light, but sturdy and of the highest build too. 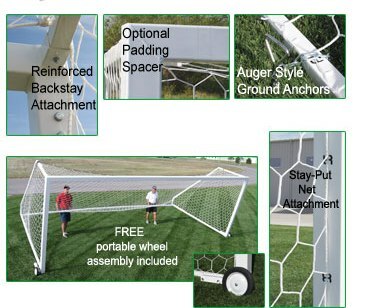 Goal posts from Golden Goal are portable, durable and safe – checking the list of items on all of the things you would consider before buying. 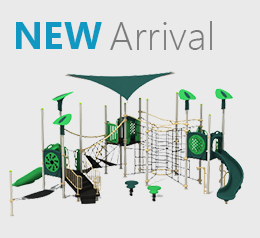 Designed with sturdy built high tenacity polypropylene (HTPP), the hexagonal mesh is professionally built with Non-abrasive knotless nettings. The strong knots ensure that the net stays intact in its original shape and size even after a forceful impact during the game. The great thing about the hexagonal soccer net provided by Creative Systems Recreational, Inc. is that they can be used with any kind of goal posts with identical dimensions. 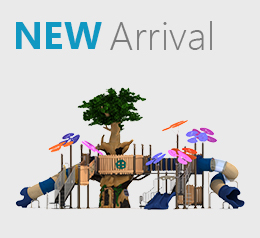 In addition to its highly durable structure, the white mesh comes with a heavy perimeter and attachment rope. Golden Goal are providers and manufacturers of professional-grade soccer equipment. 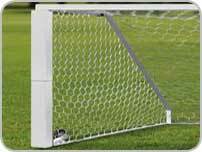 They provide permanent and semi-permanent soccer goals and set a new standard in the soccer industry for durability, dependability, and safety. You won’t find that combination elsewhere, that’s for sure! All Golden Goal soccer goals are manufactured to exacting specifications for a true, seamless fit throughout and are built entirely out of aluminium to keep things light, strong and durable. 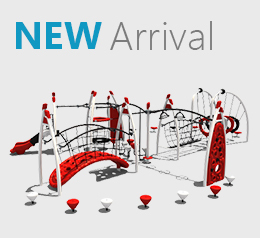 Creative Recreational Systems Inc. is a proud distributor and provider of the best Golden Goal soccer equipments. Backstays are galvanized and tubing is white powder coated. Nets are made up of Heavy duty high tenacity polypropylene. 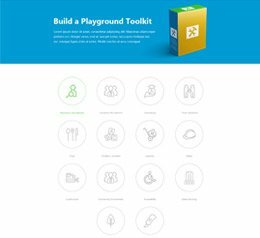 Creative Recreational Systems Inc. brings you FreeKick Soccer – the best name in backyard and small commercial area soccer. 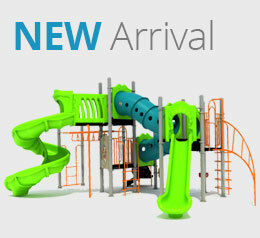 Their products are some of the most durable and safe and are perfect for small and medium-sized settings. The goals by FreeKick Soccer measure 3″x 1 1/2″ in height and are constructed entirely of aluminium. They also have 3/4″ radius corners for additional safety and also feature galvanized backstays to ensure the game never comes to a nagging stop. 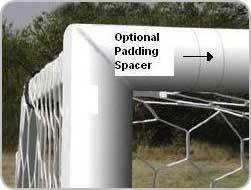 If you are looking for a heavy duty soccer post with the tendency to survive vigorous impacts, then there is nothing better than galvanized soccer post upright padding provided by Creative Recreational Systems, Inc. 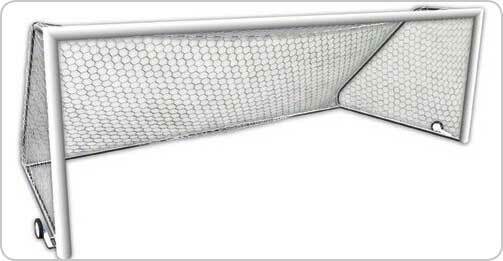 The 1″ thick padding with the 48″ tall section ensures players’ safety by avoiding the collision with the soccer uprights. 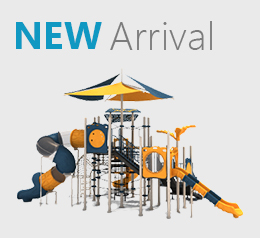 The padding conveniently fits the 4″ x 4″ square uprights without affecting the ball rebound. 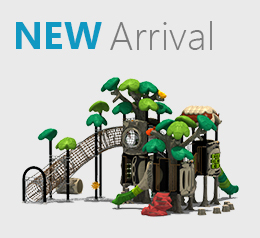 For easy handling and expedient shipping, the product is sold in pairs.